College mascots are supposed to be intimidating, but most importantly entertaining, as they are what really get the crowd yelling and roaring during the game. Most mascots are some type of animal that is seen as tough or dangerous like a lion, bear, or an eagle. However, not all mascots are rough and tough like you’d imagine. Some are actually quite silly and comicial. 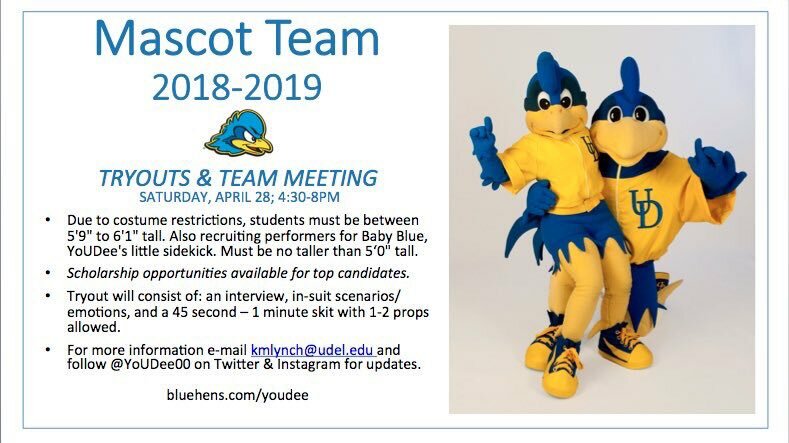 YoUDee, the fighting Blue Hen of the University of Delaware, is definitely the most historical mascot on this list. In fact, he’s such a popular mascot that in 2006 he was inducted into the Mascot Hall of Fame and most recently, in 2009, he won the UCA Open Division Mascot National Championship. As the university’s story has it, YoUDee is blue and gold because his great-great-great grandfather, who fought in the American Revolutionary War, was given the Gold Medal for Valor at the Battle of Trenton. It’s said that those soldiers under the command of Jonathan Caldwell would often times carry about blue hens into combat in order to hold cockfights when the fighting died down or there was time to spare. These men are compared to the hens, and in essence seen as very brave and daunting. However, maybe it’s just me, but YoUDee looks way to nice to be a quality college mascot. You’ll find Peter the Anteater cheering on teams at the University of Irvine and riling up the crowd, but he is more than just a mascot. He also attends political rallies and events, even meeting the past U.S. President George W. Bush. Peter the Anteater came about as an idea from Johnny Hart’s “B.C.” comic strip. The university has given him an age, a birthday, and even a major and minor at the college. Though he’s buff, has a mean face, and his markings may make him look a little scary, who’s really shaking in their boots after looking at a long-tongued animal that eats ants? University of Wyoming is one of the few universities to have two mascots. One is human and the other is a live animal. Pistol Pete, the human half of the mascot team, wears chaps and pistols, and has a huge mustache, of course. Cowboy Joe, the other half, is a pony that often wears a coat sporting his name. He’s often seen at the games and any other UW social events. A pony and a cowboy seem like really nice and friendly mascots for any college to have, but UW sports them proudly. 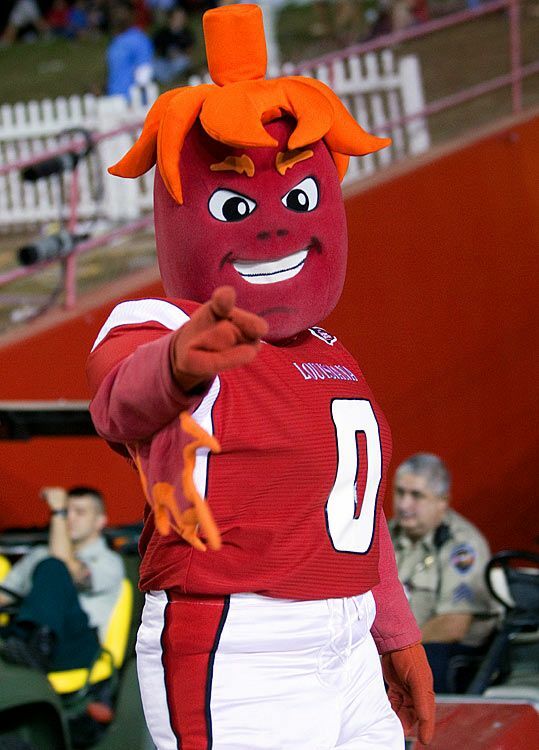 Cayenne is the fourth and newest mascot at University of Louisiana at Lafayette that was introduced just nine years ago in 2000. Before him were the Bulldog, Mr. Ragin’ Cajun, who was just animated, and Fabulous Cajun Chicken. Cayenne doesn’t have a huge background or cool story. The students at the college simply wanted a mascot who was able to embody the south, especially Acadiana, where the school is located. They simply wanted a true, physical representation of a Ragin’ Cajun and the spirit of the college’s location. Food mascots definitely aren’t the scariest, but Cayenne does have a face that may fend off a few competitors. In any case, I wouldn’t be so proud to call a red pepper my school mascot. If you don’t know much about seafood, more specifically large saltwater clams, then you probably think that a geoduck is some type of waterfowl. However, a geoduck, (pronounced goo-ee-duck) is an extremely large saltwater clam that can have a shell of over nine inches in length. Outside of the shell is a siphon, which can be more then three feet in length. Speedy, the new mascot at Evergreen State, was introduced in 2006 and is said to bring the team a lot of luck. The mascot came about after the school hosted an individual learning contract in which a student was able to design a new mascot. Though it’s new, the mascot costume is just horrible. It looks something out of a sci-fi TV show gone wrong. Even if it looked less amateur, how frightful could a geoduck really be? Carnegie Mellon University definitely has an interesting theme, which then led to an interesting mascot for their college. The university is highly centered around a Scottish motif, due to the fact that Andrew Carnegie was Scottish. 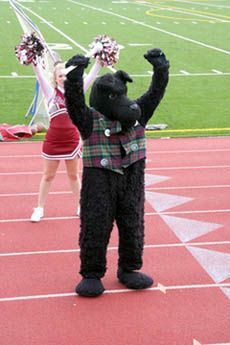 As silly as it seems, the university’s mascot is a Scottie Dog named Scotty. At times they have a live black Scottish terrier – Bill Cosby gave them the dog as a gift– at some games there is a student in a costume. Now of course, if you’re afraid of little yappy dogs, then Scotty will surely scare you right off of your rocker. But, when comparing Scotty to other mascots, he’s definitely not at the top of the chain. In the 1970s, students who attended Scottsdale Community College were highly upset at the amount of money that was being put into the college in order for it to become a junior college sports powerhouse. Because of this, the students felt a need to rebel a little, and were given the option to set up an election to name the new school’s mascot. In the running were three possible winners: the rutabaga, the artichoke, and the scoundrel. Obviously, the artichoke won and Artie soon came to life. Even though the college officials called the election void and fake, the artichoke mascot has continued to call SCC his home. It’s safe to say that a vegetable isn’t the greatest pick for a mascot. Unless you live in some world with man-eating artichokes, Artie isn’t so scary at all. Tasty, surely. Banana slugs are slow, bright, slimy, and definitely not anything most would imagine being a mascot; but nonetheless, Sammy is the mascot at the University of California-Santa Cruz. Though it’s hardly a mascot that would be seen as intimidating or crowd-riling, it truly mimics the school’s main pillars: non-aggressiveness, flexibility, contemplation, and stepping outside of the status quo. 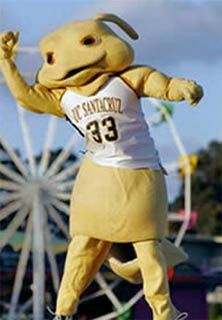 The banana slug was the unofficial mascot of the college for decades. In 1986, students at the university pleaded with the Chancellor to bless the slug as its official mascot (the previous Chancellor had selected a sea lion as a possible mascot). The students continued to demand the change and eventually won after appearing on the David Letterman show. WuShock came about around the late 1940s after a student named Wilber Elsea decided that the university needed to host a competition that involved designing a mascot that embodied the school. Before the contest, the university was unofficially referred to as the Wheatshockers, due to the fact that students often earned money by harvesting or shocking wheat in nearby fields. However, the school wanted something tougher with a no-nonsense scowl. Soon enough, the name WuShock came to life and today you’re sure to find the big yellow mascot with wheat all over at the games. Maybe it’s just me but I wouldn’t find this mascot to be intimidating, no matter how mean the look on his face is. Delta State University is said to have two mascots. The oldest and most official mascot is the Statesman. This mascot is named after State Representative Walter Sillers Jr., House of Representatives Speaker for 20 years, who played a big role in the town where the school is located (Cleveland, Mississippi). There is also a female version of the Statesman, called the Lady Statesman. Though the Statesman is said to be the official mascot, it’s rare that you’ll find him at every sports game. What you will find is the Fighting Okra, who came to be extremely popular in the 1980s. It’s said that the new mascot grew out of the thoughts of those who didn’t believe a Statesman was frightening at all. 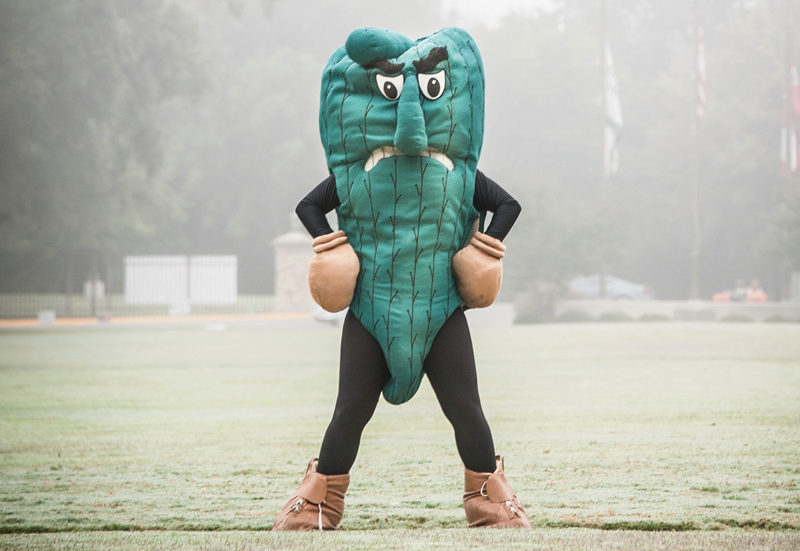 There are plenty of theories as to wear the okra idea came from, but it’s said that a few sports players came up with the idea of needing a mascot that was mean and green, and okra fit that perfectly. Though a funny mascot, I’m not so sure just how fear-inducing it is. Next Article 10 Things You Can Learn From Martin Luther King, Jr.
Scottish terriers have a stronger jaw pressure than pit bulls and were used to hunt and kill badgers! Bears won’t even mess with badgers in the wild! Anyway, they aren’t simply yappy little dogs. They’re tough and scrappy and seem like a pretty cool mascot.